The 1970s were an interesting time for Godzilla movies. At this point, there was no doubt that these films were made for little kids and that Godzilla was pictured as a super hero. But starting with “Godzilla vs. Gigan,” it felt like Godzilla’s threats were becoming less and less world threatening and more silly, like a Saturday morning cartoon. This was especially the case with “Godzilla vs. Megalon,” when Godzilla used kung-fu to fight a cockroach monster alongside a giant smiling robot. 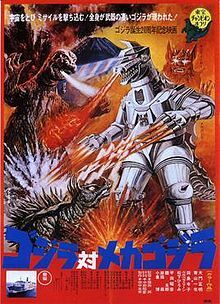 Well the next Godzilla film, “Godzilla vs. MechaGodzilla” sought to fix that problem by making a film that took Godzilla and his opponent seriously while still keeping the tone and atmosphere light-hearted enough for children and adults to enjoy it. 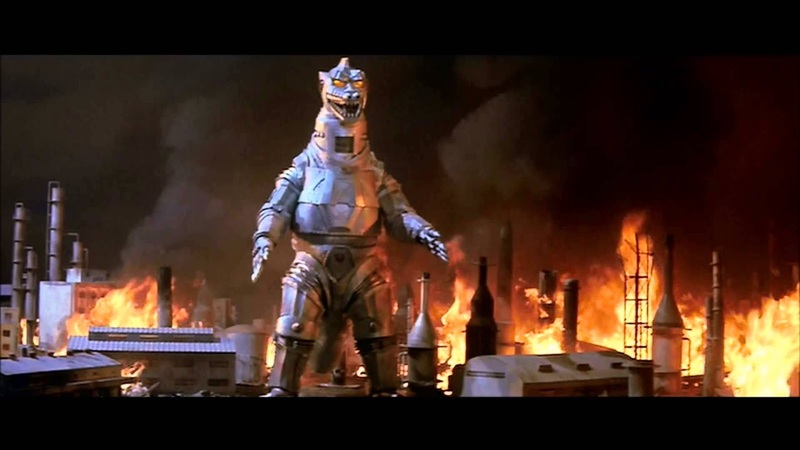 This was also Godzilla’s 30th anniversary film and introduced us to my favorite Godzilla villain, MechaGodzilla. The film was directed by Jun Fukuda, who had previously directed the last two Godzilla films, “Gigan” and “Megalon,” as well as “Ebirah, Horror of the Deep” and another Godzilla film we’ll get to much later. In his later years, Fukuda would go on record to say that he wasn’t a fan of Godzilla but was under contract to make Godzilla movies for Toho. He once said that he wasn’t proud of any of the Godzilla films he did, which is a shame because he made some great monster movies, this being a pretty good one. Fukuda did admit that he would rather be making spy movies, which he did with “ESPY” in 1974, though one could argue that he got to do a spy film with “Godzilla vs. MechaGodzilla” too. Our story begins, oddly enough, in Siberia, where Anguirus has awaken and seems to sense that something is wrong. He roars out and, somewhere in the world, the side of a mountain erupts in an explosion and Godzilla’s roar can be heard. This opening always confused the hell out of me. In the VHS print of the movie, you cannot tell that Anguirus is in Siberia, it looks like he might be underground instead since he’s just surrounded by rocks and dirt. And is it supposed to say that Godzilla was in the side of the mountain? Given what we see later, that’s probably not the case. We cut to Okinawa, where an ancient royal Azumi family ceremony is taking place but is cut short when one of the dancers breaks down and has a vision of a “great and terrible monster that will destroy Japan.” Oh, it must be Tuesday. Time for another monster to try and destroy Japan! One of the witnesses, Gosuke Shimizu (Masaaki Daimon), later discovers a long lost cave in Okinawa and, after searching through the cave for about four minutes, discovers a statue in the shape of the Azumi family’s ancient guardian, King Caesar, along with a strange shiny piece of metal. He dislodges the statue and finds a phrase engraved on it – “When a black mountain appears above the clouds, a monster will appear to destroy the earth.” Gosuke takes the statue with him back to Japan so he can have his friend, a professor (Hiroshi Koizumi), look it over. But on his way back, he looks out his airplane window to find a massive black cloud that looks exactly like a mountain, exactly what the prophecy had predicted. He finds out from the professor that there is more to the prophecy. “When the red moon sets and the sun rises in the west, two more shall appear to save humanity.” The professor is also able to find out that the metal Gosuke discovered is similar to titanium, but is not from our planet. Meanwhile, the entire time Gosuke has made is trip, there have been people watching him from every corner, including a man with sunglasses and a trench coat. In the middle of the night, a thug breaks in and try to steal the King Caesar statue from him but fails and flees. Shortly after this, a giant meatball-shaped rock explodes out of Mt. Fuji…I don’t make any of this up, I just report it to you guys as it happens. Once the rock lands, it explodes and out pops Godzilla, but with a different roar. This Godzilla’s roar is more like a high-pitched screech and far more mechanical. Everyone starts to fear that the prophecy is coming true and that Godzilla is the monster that’ll destroy the world. Godzilla beings his rampage through the countryside, destroying several buildings with his bare hands while also moving just a bit differently. In the middle of all this, Anguirus pops up out of the ground and starts attacking Godzilla. Our characters find this odd, since by this point Godzilla and Anguirus are supposed to be best friends. But as Anguirus continues to attack Godzilla, he chips away some skin on Godzilla’s shoulder to reveal a shiny metal interior, showing that this isn’t the real Godzilla. This leads to possibly the most brutal beat down in the history of the Godzilla movies, as the Fake Godzilla kicks Anguirus around, tosses him by his tail and then breaks his jaw like King Kong loves to do T-Rex’s. Luckily this doesn’t kill Anguirus, who just walks away with a destroyed jaw and bleeding like crazy. Gosuke goes through the wreckage of the fight to find more of that strange titanium, but in greater quantity. We cut to a few hours later, when Fake Godzilla has made his way to an oil district of Tokyo and has set the entire area ablaze with his flamethrower breath. And I have to say, I love this entire sequence as it uses the entire miniature set to good use and shows the scale of this Godzilla’s destruction. But it gets even better in the middle of his attack, when a building near the pier is destroyed to reveal the real Godzilla ready to fight. As a kid, my jaw dropped when I saw this scene. Two Godzilla’s at the same time, one good and one evil, ready to duke it out to see who was better. The fight uses the entire miniature set and each explosion make their conflict feel even more grand, especially with a strange yellow tint to everything. The real Godzilla chips more of the fake Godzilla’s skin away and the professor finally deduces that the Godzilla that flew out of Mt. Fuji is a cyborg. And without any justification, the film cuts to a man in a silver jump suit smoking a cigar who says, “Damn Godzilla. You’re mistaken if you think your power is a match for MechaGodzilla.” He then proceeds to flip a couple of switches to burn away all of the fake Godzilla’s skin and reveal MechaGodzilla in all his cheesy, badass glory. The reveal of MechaGodzilla is one of my favorite moments in all of these movies. Perfectly paced to build up mystery, while still keeping the mystery of MechaGodzilla’s creators hidden, while the first shots of MechaGodzilla show how he is decked out in stylish weapons. The music is flashy yet cool, and the setting of the burning oil refinery is unique and adds some great lighting to this whole scene. To top it off, MechaGodzilla unleashes his attack on Godzilla and downs him on his first missile strike, showing off how much more powerful he is than Godzilla. It’s only thanks to a clash of beams that ends the fight in a draw, but Godzilla certainly gets it worse as his blood coats the ocean. Shortly after this, we learn a lot more about MechaGodzilla’s creators. They are aliens from another galaxy, whose planet is slowly being consumed by a black hole. They’ve come to Earth to claim it as their own and intend to use MechaGodzilla to wipe out humanity. 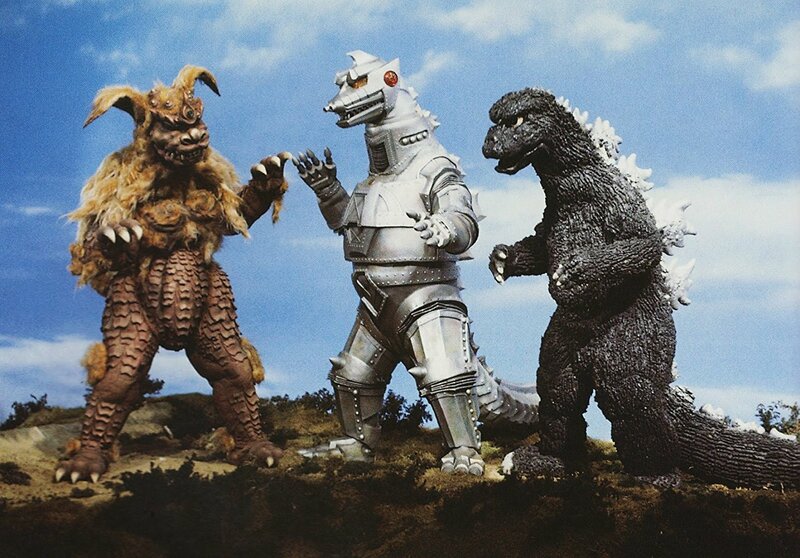 As a kid, I always wondered why they made their robot look like Godzilla and why they disguised it as the real Godzilla at the beginning of the movie. For that, I like to look at the short scene we had earlier with the guy who talked about MechaGodzilla’s power and how relaxed he was with his cigar and cool voice. These aliens are all about style, they want to have all the power but look good while doing it. So of course they would design their giant killer robot in the shape of our greatest champion, it is to demoralize us and show how much better they are. And to be fair, after their first encounter, it is clear that MechaGodzilla is far superior to the original. Noticing how screwed Earth is if the Black Hole aliens get what they want, our heroes take the second part of the prophecy to heart and find a way to make it come true. They head back to Okinawa to see what they can do. Weirdly enough, the aliens know about the prophecy as well and send more thugs and goons to get the statue and destroy it so that King Caesar cannot be summoned. This is where “Godzilla vs. MechaGodzilla” becomes more of a spy/action film than a monster film, since our heroes are being hunted down for their statue and have to fend off multiple attacks while onboard a ship heading to Okinawa. This goes on for about half an hour, as the goons attack, the guy in the trench coat returns but continues to be sneaky until it’s revealed that he’s an Interpol agent who is trying to find his fellow agent, supposedly kidnapped by the aliens. It’s at this point that it stops feeling like a Godzilla movie and more like a James Bond film. It does the spy and action scenes fine, but after the great set-up they had with the scene at the oil refinery this all feels like a bit of a letdown. Eventually, our heroes get back to Okinawa and outsmart the goons and thugs and get the statue onto the ancient pedestal just in time to complete the prophecy and open the side of a mountain that reveals the hidden location of King Caesar, who is still asleep. This leads to the stupidest moment of the movie when the Azumi family dancer from the beginning of the movie sings to King Caesar to wake him up. Not only does she sing to a sleeping monster, but she sings the same song twice, and all while MechaGodzilla is slowly walking towards King Caesar. MechaGodzilla is literally letting her sing to him when he could just fly over to destroy King Caesar or blast him with his beams or missiles while he is asleep. Which brings me to an grievance I have with this film – With how King Caesar is a up-front and physical fighter against MechaGodzilla, and sounds like King Kong, how much cooler would this film have been if King Caesar was replaced with King Kong? That would bring everything full circle, where Godzilla and his first big opponent have to team up and fight his strongest enemy yet. Not much would have to be changed, since both Kong and Caesar have an entire religion and mystery surrounding them, and the two pretty much act the same also. But King Caesar is such a huge focus on the plot of the film that it is ultimately disappointing once he finally shows up. Our heroes spend about a third of the runtime trying to bring Caesar to life and all we get out of it is a short fight between the two that ends as Godzilla shows up again to join the fight, completing the prophecy that two monsters would fight the threat that could destroy the world. Actually, the fight between MechaGodzilla and King Caesar is comical. Caesar can reflect MechaGodzilla’s eye lasers back at him…but only if the eye lasers hit Caesar in his eyes. MechaGodzilla quickly figures this out and simply targets his eye lasers at other parts of King Caesar’s body or just uses other weapons that cannot be reflected. Then Caesar just ends up hiding behind a mountain like a scared puppy until Godzilla arrives. But once Godzilla gets back into the fight, things get awesome again as the two Godzillas duke it out. Godzilla proves to be the most resilient he’s ever been, switching between quick physical strikes and his atomic breath and refusing to go down against MechaGodzilla’s attacks. But MechaGodzilla is still able to counter Godzilla at every turn, especially with his ability to fly and shoot beams and missiles that ground Godzilla. Even when King Caesar rejoins the fight, after cowering the corner for a little while, MechaGodzilla still finds a way to overpower both monsters at the same time. One of my favorite bits is when Godzilla and King Caesar have MechaGodzilla front and back, but MechaGodzilla turns his head 180 degrees to Godzilla has to face missiles and bombs, while Caesar gets the eye lasers. And just for good measure, after MechaGodzilla blasts both monsters to the ground, he uses his finger missiles on a couple of nearby houses. The movie always takes full advantage of the fact that MechaGodzilla is a robot and can do all these weird things with his mechanical body. But the best moment is when MechaGodzilla unleashes his all-out assault, literally unloading all of his missiles and beams on the helpless Godzilla and King Caesar. There’s missiles coming out of every possible spot on MechaGodzilla, including his toes, knees, fingers, mouth, and a piercing beam from the center of his chest. Godzilla and Caesar are tripping over themselves trying to avoid every attack and the entire landscape is destroyed in the carnage. MechaGodzilla has become an entire armory of kaiju-busting weapons. Eventually, Godzilla barely manages to get through MechaGodzilla’s all-out assault, but then has to take the attacks at point-blank range, leading to Godzilla spewing blood everywhere and getting some finger missiles stuck in his neck. This leads to my only complaint with the monster scenes in this movie, Godzilla’s deus-ex-machina new power that he developed after getting struck by lightning multiple times and becoming a magnetic pole. Remember kids, if you get struck my lightning several times in a row, it’ll turn you into a magnet! The problem with this is that it feels like it comes out of nowhere. While there was a scene earlier to show Godzilla getting the power, that doesn’t mean it suddenly makes sense or that it works for the story. They did it because they wrote themselves into a corner and couldn’t come up with a better idea so Godzilla could beat MechaGodzilla. With the ability to turn himself into a magnet, Godzilla forces MechaGodzilla to come to him, even reeling MechaGodzilla in like he was a fish on a hook at one point, and grabs MechaGodzilla from behind. King Caesar rams into MechaGodzilla a couple of times for good measure before Godzilla twists his mechanical clones’ head off to finally defeat his cosmic foe. At the same time, the Interpol agent and the professor work together to disable the Black Hole aliens controls, kill their leader and escape their exploding base alive, ending the threat of MechaGodzilla and the aliens once and for all. Godzilla returns to the sea, while King Caesar goes back to sleep and peace is resorted to Okinawa and the world. “Godzilla vs. MechaGodzilla” is one of the few Godzilla films I have no problem popping in every once in a while just to watch the monster scenes and skip the human scenes. Not that the human scenes are terrible, but that they are weak compared to how amazing the monster scenes are. Both of the confrontations between its titular monsters are highlights of the entire Showa series, showcasing a much more vulnerable Godzilla that offers a nice change of pace. For once, it feels like Godzilla isn’t uberly strong and has to work much harder to achieve victory, facing off against a monster that is just as cool as him. The music by Masaru Sato is heart-pounding and catchy with its use of horns and drums. Still, so much focus on the ultimately pointless King Caesar does bring this film down but not enough to say this is a bad film. This is an extremely fun monster movie, but a below-average spy thriller.